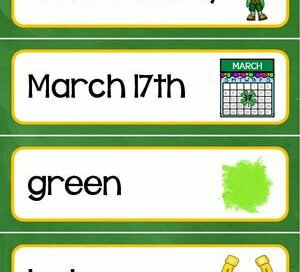 This set of St Patrick’s Day vocabulary cards come in a portrait configuration. There are four words per page divided horizontally on five pages with 20 words in all. 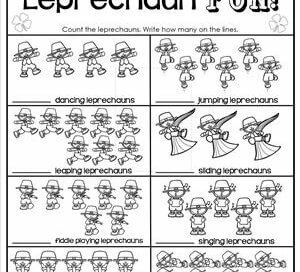 St Patrick’s Day – Counting 1-10 – Leprechaun Fun! These little leprechauns are showing us how to have some fun! Your kid’s job is to count how many in each set and write that number on the lines. These shamrocks are just so darn sweet looking! 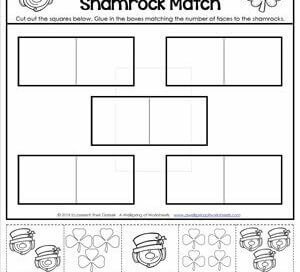 Kids will need to count these sweet shamrocks in each ten frame and write how many on the lines. 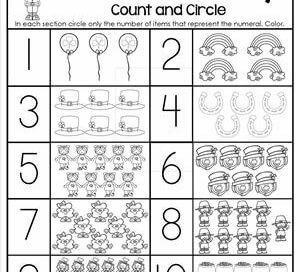 In this counting worksheet kids look at the number on the left, then count and circle only that many number of objects. 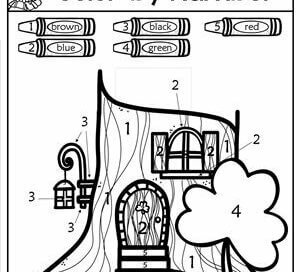 In this cut and glue worksheet kids cut out the squares at the bottom of the page. Then they match the number of leprechauns and shamrocks and glue side by side. 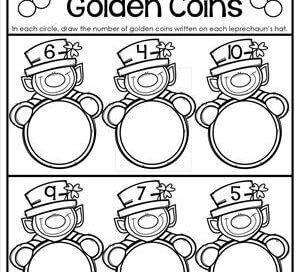 Have your kids look at the number on each leprechaun’s hat and draw that many coins in the circle. You may want to have them draw the coins in pencil and color in yellow crayon. These folks created some works of art with shamrocks. 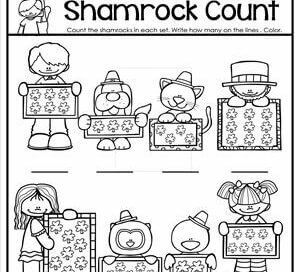 Count how many shamrocks on each person or animal’s piece of art and write how many on the lines. 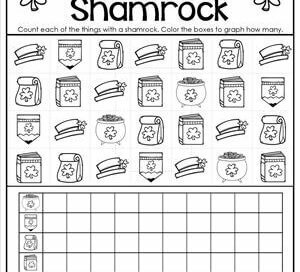 Have your kids count the number of each of the five items with a shamrock and graph how many on the bottom portion of the page. Let the party start! 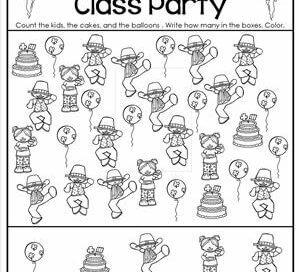 Bring the cake, dancing and leaping kids and the balloons! 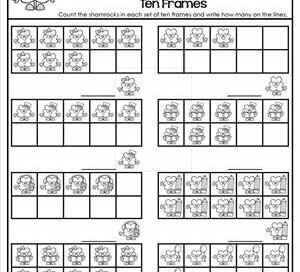 Have your kids count the number of each (there are between 1 and 10) and write how many in the boxes. Kids get to show you their number tracing stuff by putting their pencils to the paper and following the lines to make the numbers. Here’s a possibility of what a leprechaun home might look like. Kids look at the numbers on this house, check them against the color code, and color. 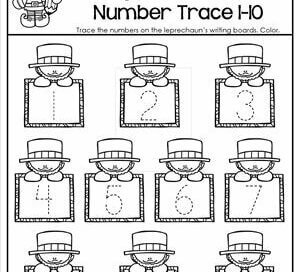 Kids look at the numbers on this leapin’ leprechaun, check them against the color code, and color. Notice the arrows for the small areas where numbers can’t fit. 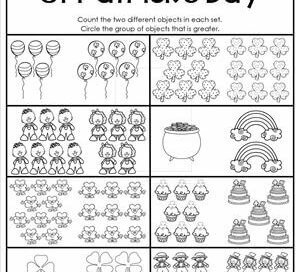 Kids count the two different St Patty’s Day related objects in each set. Then they circle the group of objects (or leprechauns!) that is greater. 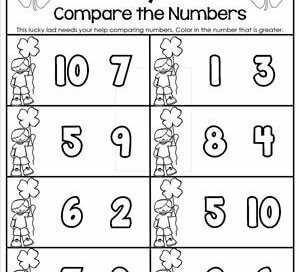 Your awesome kids can show you how they know how to compare numbers. They simply look at the numbers in each set and color in the number that is greater. The leprechauns on this page are busy at school. 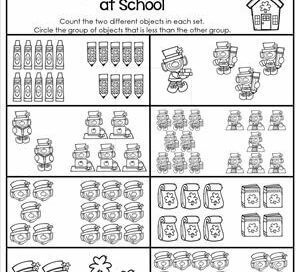 Kids count how many in each set and circle the group of objects that is less than the other group. 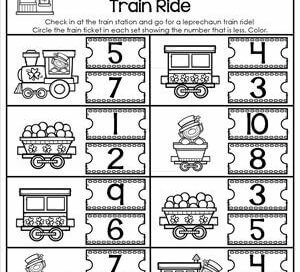 In this worksheet kids compare the numbers on the tickets in each set and circle the number that is less. 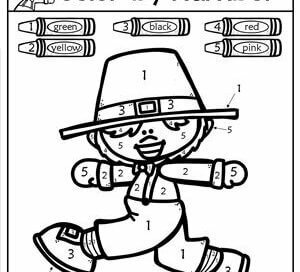 Coloring recommended – pass the green please!